WE TRAIN SALES PEOPLE, WE HIRE SALES PEOPLE, WE ARE SALES PEOPLE! Selling is recognising potential clients, building healthy, mutually beneficial relationships with them and maintaining their business by serving them well! Many companies have opened for business with great products and great potential but failed to realise that products don't sell themselves, regardless of how good they are. People buy people and the most successful companies have the most successful sales teams. Whether you're a brand new sole trader or well established corporate name, we'll help you take your sales to the next level. Call us now on free number 0800 2980152 or email us for more information. OUR CLIENTS GO BANANAS ABOUT US! The SALES MONKEY two day training course was a great introduction to marketing and sales. It was tailored to address my specific market with the focus on closing sales and building relationships. It covered all the aspects I will need in my new business venture. 5 stars! Philip Otoole (Director) OVERSITE ARIEL SURVEYS"
"I found the sales course with SALES MONKEY very beneficial and helpful in gaining more clients for my business. I’ve learnt lots of skills that help me feel more confident in achieving my goals whilst selling my service to potential clients. If you have a business and want to grow I would highly recommend the SALES MONKEY two day sales course. WE HAVE 3 MAIN BRANCHES IN OUR TREE! We offer individual, team or company-wide direct sales training and mentoring. We can take both your sales and retention to the next level. 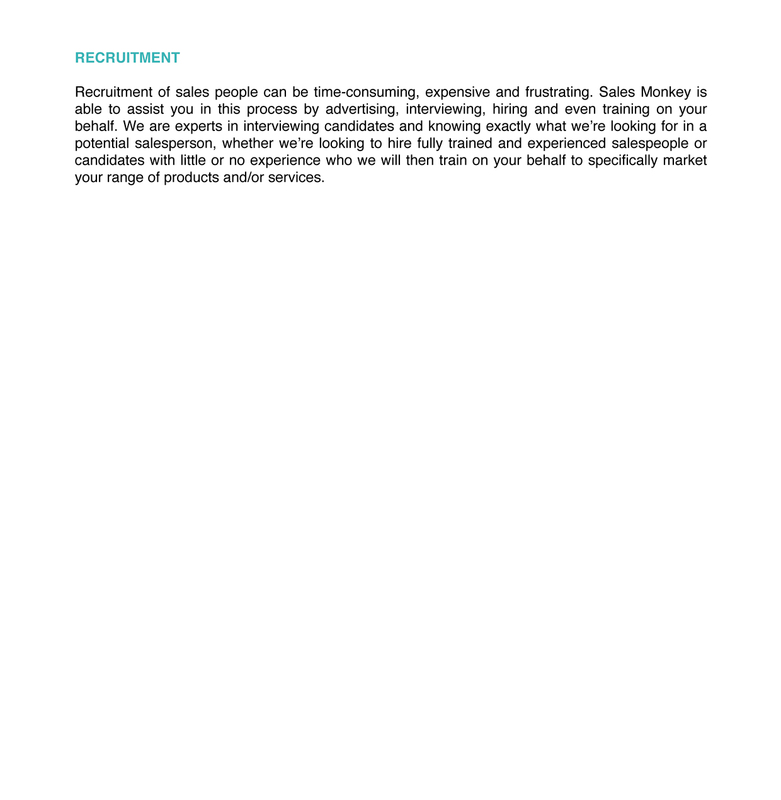 More..
Do you need to recruit salespeople? We'll help you build a successful and motivated sales team by hiring and training on your behalf. More..
Is time of the essence? No time to build a coherent and successful sales force? We can take you directly to market and sell your products for you! More..
Our main monkey with over 30 years top tier experience in international direct sales, Duncan cut his teeth in the tough world of American crew sales, where he re-wrote the record books for personal and team sales production. He went on to train and run a multitude of successful teams of direct sales people on 4 continents, marketing products ranging from chemicals to real estate. Returning to the UK in 2006 with 20 years and 40 countries of experience under his belt, he was the last person in the UK to be awarded the coveted Combined Insurance Of America "Ring of Diamonds”. Combined Insurance was founded by W. Clement Stone, author of Success Through A Positive Mental Attitude, who was later joined at the helm of the company by Napoleon Hill, author of Think And Grow Rich. DO WE NEED TO LEARN TO SELL? "DON'T SELL PRODUCTS, SELL YOURSELF!" No matter how good a product is, no matter how much you invest in research and development, if you can't sell that product you don't have a business. Your ability to sell both yourself, and in turn your products and services, will ultimately decide whether or not your business will succeed. And that's where Sales Monkey swings in. 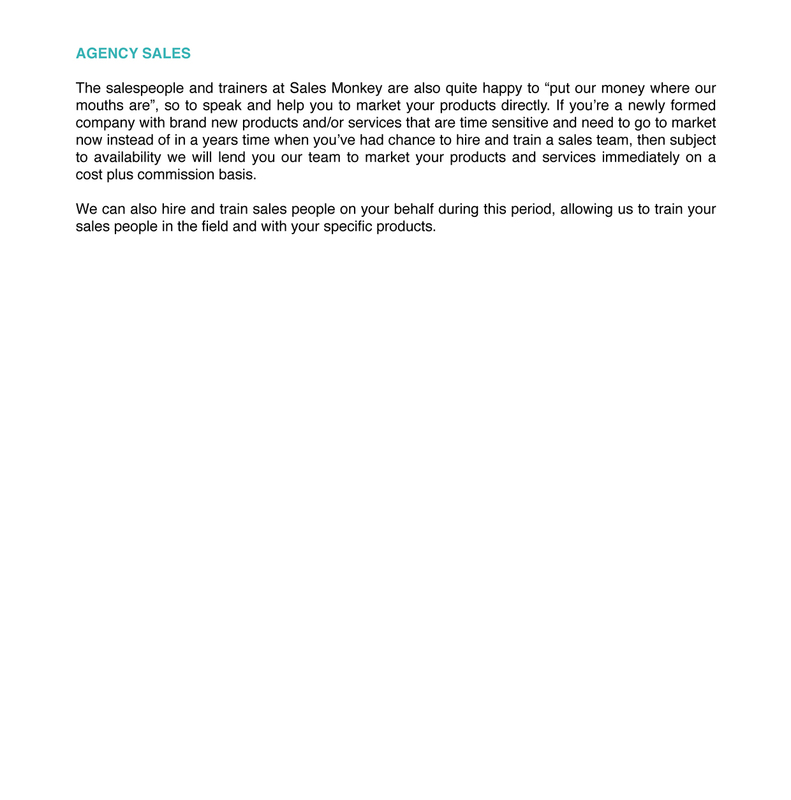 We're here to teach you to sell, using over thirty successful years experience in top tier direct sales! In order for us to comply with the new GDPR regulations you must consent to us storing and using your contact information in order to reply to your email. We will not share any of your contact information with any other third parties. Please check the box below to consent. There's a lot to be learned from this graphic showing how wolves lead and are led. STAY FOCUSED – YOU CAN’T AFFORD TO TAKE YOUR EYE OFF THE BALL.. WHEN THE AUTOMOBILE INDUSTRY ASKED SALES MONKEY TO HELP WITH CAR SECURITY..